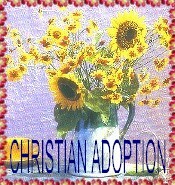 CHRISTIAN ADOPTION COUPLES.FAMILIES: "WE'RE MATCHED !" or "WE'RE EXPECTING !" HOW WILL IT HAPPEN FOR YOU ? "I CAN'T FEEL THEIR COLOR!"